A record number of American households have student loan debt. Some 19% of households had student loans in 2010, up from 15% just three years earlier, according to a new report from the Pew Research Center released Wednesday. Student debt has exploded in recent years as more people attend college, more turn to debt to finance it, and more take out bigger loans while in school, said Richard Fry, a senior economist at Pew who authored the report. This is bucking the trend of Americans shedding debt during the Great Recession and its aftermath. "In the age of deleveraging, student loans are one form of rising debt," he said. On average, borrowers owed $26,682 in 2010, up 14.3% from three years earlier and more than double what they owed in 1995. But while stories abound of people mired in six-figure debt, they are the exception, Fry said. Only 4% owe more than $100,000. In total, student loan debt is approaching $1 trillion, according to a separate Federal Reserve Bank of New York report. Student debt levels are rising across the board, but they are growing the fastest for the nation's poorest and most affluent, Fry said. The poorest fifth owed 13% of the outstanding debt in 2010, up from 11% three years earlier, even though this group is less likely than richer Americans to attend college. And the wealthiest households were on the hook for 31% of the student debt owed, up from 28%. 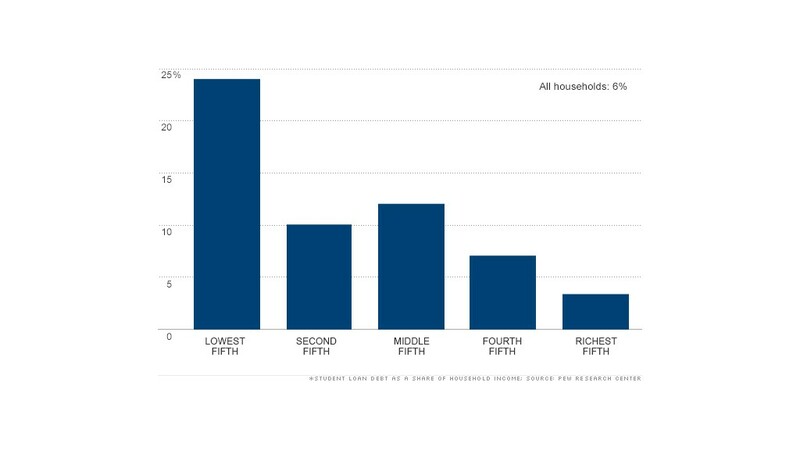 The richest share of households, not surprisingly, is better able to handle the burden. College debt accounted for only 3.3% of their household income. But student loan debt ate up nearly a quarter of the earnings of the poorest fifth, the study found. Some 44% of student loans are owed by those under age 35, with another 26% owed by those between 35 and 44. Senior citizens don't fully escape either, although they accounted for just 2% of the outstanding student loan debt. Recent grads with college debt may fall into the lower income categories, especially since it's harder for them to find jobs. So they may struggle for a while to pay back their loans. "They are well-educated, but not yet making killer salaries," Fry said about those just out of school. "For a while, they will be burdened."